So the results are in! So awesome to see the final scores and see what games got in overall, and see where everyone else’s results are on the rankings. Since this is my third successful Ludum Dare, I thought I’d try a little comparing to see how much I did better (or worse) at this point. Then for future Ludum Dare entries I can then add in those results and probably build a chart to see my progress. So while the ranking don’t appear to have changed, the average score for most categories has improved. The only category to have gone down considerably over the three LDs was Humor, although in fairness since my game wasn’t intended to have humour so I could’ve omitted the category. I’m also one of the people that got 100% coolness which is an awesome surprise, it means I’m (technically) listed on the results page. At the moment I’m balancing University work and turning Glow Drop into an Android and Windows Phone release as Glow Drop DX. So hopefully you might see more from me in the future? Hey everyone! With the New Year coming up, I figured I generate this stats thing the WordPress guys made to show you how well this site does! Thanks for all your support! Ludum Dare 31 Favourites So Far! So after rating 100 games for Ludum Dare, I thought I’d talk a bit about a few of my favourites from the jam. They may not be the best out of the competition, but these were the ones that I find have an aspect of good entries that each of these succeed at. This is the entry done by brilliant flash game developer Jussi Simpanen, aka AdventureIslands. He always does games for jams big and small and his entries usually bring a quirky design and incredible polish to them, and this one is no exception. In Tightrope Theatre you must travel from A to B, all while riding a unicycle avoiding fire, spikes and the ground below. The entire game is 24 levels long, and feels very complete for a game done in two days, although you kind of wish there was more. Knowing that Jussi tends to add new stuff to his entries every now and then, maybe there will be more to this entry. This is an example of how you should achieve an innovative game in 48 hours, you use one mechanic with a unique spin and give it as much potential as you can. In this case, the mechanic of the game is jumping, and the unique spin is that your jumps are limited, but will increase depending on how you play. Eduardo uses the mechanic in a room where you have to jump to survive and you get this gem. Most game jams have a theme, and as a developer you are free to interpret that theme to whatever for your game: you can use a literal route (in LD31, that would mean literally running the entire game on one screen), the metaphorical route or the technical route. With Screen Mover, Sh1rogane decided to go beyond literal and technical with the theme to produce something that may look like a simple platform prototype, until you quickly realise you have to move the game window to progress. The only issue with this idea is that keyboard input it locked while the window moves, but the post jam version does fix this. Sometimes you don’t have to make a game that’s fun to make it a good entry, you can tell a story, show off some great music or in this case, make some really beautiful graphics. The puzzle game elements are clever, but this game is really good at showing off bloom and neon. It just makes it look wonderful, and the music is really soothing as well. As you may tell from my entry, I love neon glow, and this game does a great job at showing it off. If all else fails, just make a game that is fun to play, and make it addictive for an added bonus. This game’s style reminds me a lot of Terry Cavanagh’s Super Hexagon, and since the developer is planning an Android/iOS release, I recommend him get Chipzel to do music for the game. Don’t forget to play my entry Glow Drop if you haven’t already. I would first like to start this post by talking about Ralph Baer, wildly known as the father of video games who passed away on December 6th. 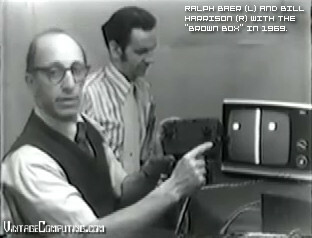 Since 1966 he always had the idea of games that can be displayed on television screens, and developed what he calls “the brown box” which had rotary controls and played a simple tennis game with two panels and a square ball. This patented idea eventually got picked up by TV manufacturer Magnavox and became the Odyssey, wildly considered the first video games console. Along with essentially founding computer and video games as we know it today, he also invented the classic electronic game Simon (and its sequel Super Simon) and carried on developing and tinkering with electronic prototypes, giving him 150 patents to his name. He lived a full life and his work has lead to the creation of the largest entertainment history, and lot of gamers and game developers are where they are today because of his work. So last weekend was Ludum Dare, the 31st bi-annual 48-hour games jam. The theme for this one was “Entire Game on One Screen”, a bit basic for a theme but it’s much better than the joke theme that got a lot hype in the voting stages (no snowmen please!). You can play my entry right now, it’s called Glow Drop and it’s a physics based puzzle game, just click the image below to go to the Ludum Dare page! I initially wanted to develop my entry using HaxeFlixel, but software issues struck and I was unable to use it, and since on the Saturday I spent most of my time developing on a train to London with no wi-fi, I decided to switch to using Construct2. Since I was out with friends and family for most of Saturday, I was hoping to release for the 72-hour jam. However, when I noticed that most of the game and the graphics were finished with four hours remaining, I felt like I could pull it off and upload for the compo, and I succeeded! I’m already getting positive comments so far, so I might use a day or two from my Christmas break to polish the game more and release it as a mobile game! If you guys like the idea let me know if there is anything I could add/change to make it work!